A councillors' revolt could stop the Tory cuts! When Jeremy Corbyn first stood for election as Labour leader in September 2015 he rightly made the call for local councils to stand together and refuse to implement government cuts. Around 450 Labour councillors endorsed his leadership challenge. But there are over 7,000 Labour councillors across Britain and the vast majority, alongside Liberal Democrat, UKIP and Green councillors too, continue to vote for cuts in the council chamber, saying there is 'nothing they can do'. That is just not true. The National Audit Office estimates that funding for local councils has dropped by 37% in real terms compared to 2010. But councils still account for over one fifth of all public spending, with responsibilities for adult social care, housing, education support, transport, recycling and rubbish collection, libraries and other services. That's a powerful position from which to organise a fightback. The previous Con-Dem government aimed to pass on responsibility for slashing local public services by 'devolving the axe' to local councils. But by giving local authorities a 'power of competence' to do "anything apart from that which is specifically prohibited", they gave councils a greater power to resist - if they would only use it. It is a fact that if just a handful of councils used the powers they have to refuse to implement the cuts the Westminster politicians could be made to back down. The Trade Unionist and Socialist Coalition has a policy platform for local council elections (below) which could make a difference. Even one councillor in a local authority taking a stand, if they used their position in the council chamber to appeal to those outside, could give confidence to local trade unionists and community campaigners to fight. A network of rebel councillors across the country could have an even bigger impact, building on Jeremy Corbyn's anti-austerity message in shifting the terms of the debate. A councillors' revolt could stop the Tory cuts! The Trade Unionist and Socialist Coalition (TUSC) will work with any Labour councillor who backs the call to refuse to implement the cuts. But any politician who votes for cuts cannot be allowed a free run at the ballot box, no matter what party label they wear. Oppose all cuts to council jobs, services, pay and conditions. We reject the claim that 'some cuts' are necessary to our services or that the national debt is a reason for austerity. Refuse to implement the Bedroom Tax or the new attacks on housing benefit. Councils should write off all housing benefit cuts-related arrears, withdraw all court proceedings and eviction orders where they have been a factor, and call on Housing Associations to do the same. Support all workers' struggles against the cuts, privatisation and government policies making ordinary people pay for the crisis caused by the bankers and the bosses. Defend the national collective bargaining arrangements for council workers. Reject increases in council tax, rent and service charges to compensate for government cuts. Vote against the privatisation of council jobs and services, or the transfer of council services to 'social enterprises' or 'arms-length' management organisations, which are first steps to privatisation. Oppose racism and fascism and stand up for equality for all. Campaign for the immediate introduction of the TUC's policy of a Â£10 an hour minimum wage for everyone, without age discrimination, including for council employees and those working for council contractors. Say no to academies and 'free schools'. We stand for good, free education for all, under democratic local authority control. Use all the legal powers available to councils to oppose both the cuts and government policies which centrally impose the transfer of public services to private bodies. This includes using councils' powers to refer local NHS decisions, initiate referenda and organise public commissions and consultations in campaigns to defend public services. Oppose council re-organisation proposals which reduce local democracy or make it easier to implement cuts. We will campaign against the imposition of directly-elected mayors. Vote for councils to refuse to implement the cuts. We will support councils which in the first instance use their reserves and prudential borrowing powers to avoid making cuts. But we argue that the best way to mobilise the mass campaign that is necessary to defeat the dismantling of council services is to set a budget that meets the needs of the local community and demands that government funding makes up the shortfall. Oppose fracking. Support action against climate change and for a future where sustainability comes before profit. THE Con-Dem government has inflicted five years of savage austerity on working class people. Unfortunately there is no prospect of this changing beyond the general election, as the leadership of the Labour Party has made it clear that a Labour government would not mean an end to austerity. The Trade Unionist and Socialist Coalition (TUSC) argues that working class people should not pay for a crisis that we did not cause. That was why TUSC was set up in 2010, co-founded by the late Bob Crow, to show that there is a clear left-wing alternative to policies of public sector cuts, privatisation, militarism and environmental degradation. TUSC has accepted from its start that there will be some Labour candidates who share our socialist aspirations and will be prepared to support measures that challenge the austerity consensus of the establishment politicians. But it is also committed to standing candidates or supporting others if that is the only way a working class anti-austerity socialist alternative can be articulated at election time. Stop all privatisation, including the Private Finance Initiative (PFI) and Public-Private Partnerships (PPP). Bring privatised public services, industries and utilities back into public ownership under democratic control, with compensation only on the basis of proven need. No to the Transatlantic Trade and Investment Partnership (TTIP) and all secret austerity treaties. Re-nationalise all rail, bus and ferry services to build an integrated, low-pollution public transport system. Take Royal Mail back into public ownership to guarantee our postal services. Bring prisons, probation, and all other parts of the justice system back into the public sector. For a high-quality, free National Health Service under democratic public ownership and control. Stop council estate sell-offs and build high-standard, eco-friendly, affordable council housing. No to academies and 'free schools'. Good, free education for all, under democratic local authority control; student grants not fees. Bring banks and finance institutions into genuine public ownership under democratic control, instead of giving huge handouts to the very capitalists who caused the crisis. Tax the rich. For progressive tax on rich corporations and individuals and an end to tax avoidance. For massive investment in environmental projects. Repeal the anti-trade union laws, reverse attacks on facility time and the right to collect subs by check-off for trade unions, particularly in the public-sector. Support the TUC's demand to increase the minimum wage to Â£10 an hour, and for it then to rise in line with inflation or wages, whichever is higher. Scrap zero hour contracts. Guaranteed hours and full employment rights for all. Cut the working week to 35 hours with no loss of pay. Invest to create and protect jobs, including for young people. Solidarity with workers taking action to defend jobs, conditions, pensions, public services and trade unions. Reinstate full trade union rights to prison officers. Deep cuts in greenhouse gas emissions - otherwise climate change, caused by capitalism, will destroy us. Invest in publicly-owned and controlled renewable energy. Oppose fracking. Move to sustainable, low-pollution industry and farming - stop the pollution that is destroying our environment. No to profit-driven GM technology. Produce for need, not profit, and design goods for reuse and recycling. Reverse cuts to benefits; for living benefits; end child poverty. Scrap benefit sanctions. Restore the pre-Thatcher real value of pensions. Reverse the increases imposed on the state retirement age, creating jobs for younger people. Promote inclusive policies to enable disabled people to participate in, and have equal access to, education, employment, housing, transport and welfare provision. Support measures to ensure disabled people receive a level of income according to needs. Equal pay for equal work. Welcome diversity and oppose racism, fascism and discrimination. Defend the right to asylum, repeal the 2014 Immigration Act and all racist immigration controls. Ensure women have genuinely equal rights and pay. Full equality for LGBT people. Defend our liberties and make police and security democratically accountable. For the right to vote at 16. No to imperialist wars and occupations! Justice for the Palestinians, lift the siege of Gaza, recognise the state of Palestine. No more spending on a new generation of nuclear weapons, huge aircraft carriers or irrelevant eurofighters - convert arms spending into socially useful products and services. An independent foreign policy, based on international solidarity - no more being a US poodle, no moves towards a capitalist, militarist United States of Europe. No to austerity and anti-working class policies, whether from the EU or Britain. For a democratic socialist society run in the interests of people not millionaires. For bringing into democratic public ownership the major companies and banks that dominate the economy, so that production and services can be planned to meet the needs of all and to protect the environment. Vote against the EU - vote against the Tories! The EU debate has been reduced in the establishment media to a clash between different wings of the Tory party. Its Cameron vs Boris, they say - two old Etonians, with another ex-public schoolboy Nigel Farage in the ring too. But what about if you're outside the 1% elite? Struggling to get by on low wages, a zero-hour contract maybe, or facing soaring rents and under-funded public services? What are our interests in the debate? The Trade Unionist and Socialist Coalition (TUSC) is arguing for a leave vote in the June EU referendum. We stand in the tradition of the late Bob Crow, the RMT transport workers' union leader and one of the co-founders of TUSC, who was well known for his support for international workers' solidarity while opposing the EU as a body that was pushing anti-worker and pro-austerity policies. 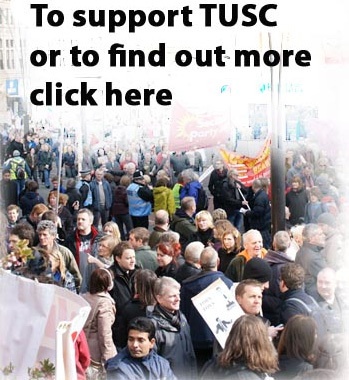 TUSC's core policies (see below) include the renationalisation of the railways, Royal Mail and other privatised public services, industries and utilities; defending the right to asylum and opposing racist immigration controls; and democratic public ownership of the banks and major companies. None of these policies are compatible with the EU treaties. So why should we give a vote of confidence to laws which, as Greece shows, would be used to try and block socialist policies? TUSC stands for real internationalism. Many of our problems - from economic stagnation, endless wars, the appalling treatment of refugees, to planet-threatening global warming - can only be solved at an international level. If society remains organised as it is today, based on a capitalist economic system that puts private profit first and divided into competing nations, the prospects for humanity will be bleak indeed. But that's why we need a socialist Europe, not the 'Employers' Union' that is the EU, with its austerity agenda. Voting Leave on June 23rd is a step towards defeating a weak and divided Tory government and building a movement that can unite with workers across Europe to fight for a different world. The TUSC core policies listed below are incompatible with the rules, directives and laws set by the EU treaties. It is true that, like other unjust laws against working class interests - the poll tax is one example - they can be made to be ineffective if they are faced down by a mass movement of opposition. But why give a positive vote on June 23rd to rules and regulations that will be used to create obstacles to the implementation of socialist policies? Re-nationalise all rail, bus and ferry services to build an integrated, low-pollution public transport system. Hands off our NHS - for a high-quality, free National Health Service under democratic public ownership and control. Reject the Transatlantic Trade and Investment Partnership (TTIP) treaty being negotiated between the EU and the US, which will significantly increase corporate power and its ability to take over our public services. Take Royal Mail back into public ownership to guarantee our postal services. Bring the privatised public utilities, including the energy companies, back into public ownership. Invest in renewable energy - publicly-owned and controlled. No fracking. Stop the moves towards a capitalist, militarist United States of Europe - the EU's so-called Common Security and Defence policy. No to a new generation of nuclear weapons, aircraft carriers or eurofighters - convert arms spending into socially useful products and services. For a democratic socialist society run in the interests of people not millionaires. Bring the major companies and banks that dominate the economy into democratic public ownership, so that production and services can be planned to meet the needs of all and to protect the environment. No to racism, austerity and anti-working class policies, whether they come from politicians in the EU or Britain. Yes to workers' unity and real international solidarity.